There is sad, tragic and what appears to be criminal news from Arizona and the search for 2 year old Sylar Newton. Skeletal remains found Tuesday near a central Arizona campground are believed to be that of a toddler reported missing in the area more than two weeks ago, and authorities say foul play is suspected. The remains were found at the bottom of a wash less than 2 miles from the Beaver Creek Campground, where 2-year-old Sylar Newton of Flagstaff was last seen the night of July 24, Yavapai County sheriff’s spokesman Dwight D’Evelyn said. Authorities said it appeared someone tried to hide the remains, which ended up in the wash after recent flash flooding. There have been no suspected named; however, there is a criminal investigation under way. 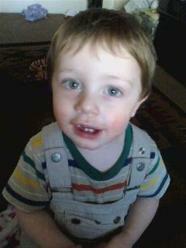 2 year old Sylar Newton was reported missing when camping with his custodial mother, Christina Priem, and her family. Sylar was at the camp site with his custodial mother, Christine Priem of Flagstaff. According to the police report, Priem, her mother Nancy Collins, 57, and Christina’s 12-year-old daughter were sleeping in the same tent as the boy at the time of his disappearance in the middle of the night. In an adjacent tent were Christina’s 14-year old son and a 14-year-old friend.